A low pressure system deepening to the north of Western Australia is likely to develop into a tropical cyclone this week. The low was located about 350km to the north of Broome on Tuesday morning and is likely to deepen as it moves towards the west during the next 48 hours. There is a good chance that it will become a tropical cyclone by Thursday. 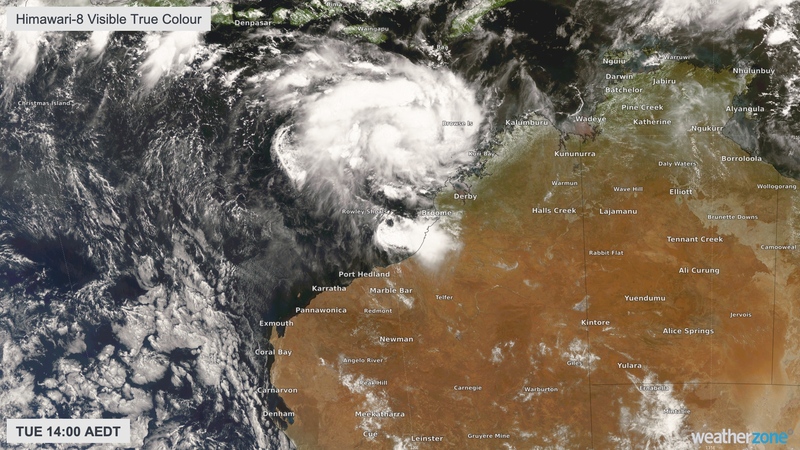 Image: Satellite image showing a low pressyre sytem to the north of Broome on Tuesday. The Bureau of Meteorology rates the low as having a 20 to 50 percent chance of becoming a tropical cyclone on Wednesday and more than a 50 percent chance on Thursday. The system is expected to travel towards the west, roughly parallel to the north coast of Western Australia, between now and Thursday. However, it’s difficult to predict where it will go from Friday. Some computer models continue taking the system in a westerly direction on Friday and over the weekend, remaining well offshore while heading out into the Indian Ocean. Other models indicate that it could turn towards the south on Friday and approach Western Australia’s the Pilbara coast on the weekend. Given the uncertainty around this system later in the week, anyone living in the Kimberley, Pilbara and Gascoyne districts should monitor the latest forecasts and tropical cyclone advisories closely during the coming week. If the low does develop into a tropical cyclone, it will be named Veronica.